The Vintage Village at the Air Tattoo is like taking a step back in time to revel in the extravaganza of nostalgic experiences. There were fantastic performances from the D-Day Darlings, Puttin' on the Blitz and the Bluebirds. Even Winston Churchill made an appearance! Daisy's Vintage Tearoom offered delicious tea and cake and the Military Vehicle Trust was accompanied by re-enactors to bring the First and Second World War to life. Boscombe Down Aviation Collection showed off a number of aircraft cockpits from the RAF'S 100 year past, allowing you to see and even sit inside icons like the Hawker Hunter. Inside the themed marquee was a packed programme of wonderful entertainment, including professional singers, dancing, and DJ. The style was, of course, a mix of wartime favourites and tunes from a bygone era, spiced with some foot stomping jumping and jiving. There was vintage traders selling fantastic clothing and accessories. 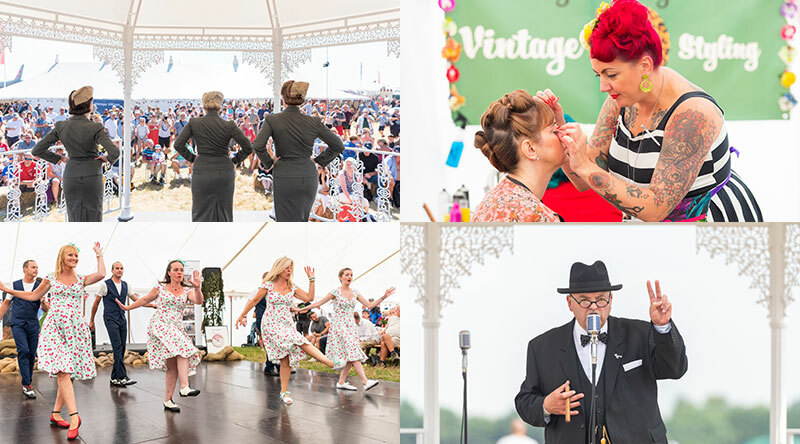 Vintage Victory Rollers were back this year at the Vintage Village offering vintage inspired makeovers during the Air Tattoo. "Thoroughly enjoyed the whole experience. Cream tea and entertainment were excellent!" "This is my current favourite place in the showground to visit when I am not looking at aeroplanes! The atmosphere is great, the stalls are interesting, the food of a much better quality than the take-away places, and the entertainment is great fun." "Always lovely to bring some nostalgia to the event. Personally I'm very interested in history of WWI and WWII so I always find the Vintage Village fascinating, the ladies singing were excellent."